Morgan Stanley: "That Was It For The Market For This Year"
We first got a glimpse that not all is optimistic at Morgan Stanley on Sunday afternoon, when we reported that Michael Zezas, the bank's chief US public policy strategist warned that unlike 2017, when the bank was bullish and cheerful, "something was different this year." That something was that much of the upside from Trump's tax reform is already priced in, and that, as Zezas said, "it feels less like ‘morning in America’ than ‘happy hour in America’. In that sense, we’re pushing back on the notion that US policy actions have meaningfully extended the market cycle, instead arguing that markets have already largely reflected, and are currently pricing in, the benefits they delivered." Worse, Morgan Stanley warned that "it is possible that spending on capex and wage growth will prevent a full pass-through, meaning 2018 earnings expectations may be too high." Translation: the market is priced beyond perfection. But if that was the preview, we got the main event this morning when Morgan Stanley's chief US equity strategist Michael Wilson, who was already downcast on the market for 2018, predicted that not only is the stock market meltup over, but worse, January may have marked the market top for the year. "Back in January when stocks were rising sharply, we heard numerous calls for a "meltup" being made by prognosticators and investors. Of course, that's how tops are made and we think January marked the top for sentiment, if not prices, for the year" said Wilson who echoed JPMorgan in pointing out that while retail may have made tentative steps to return to the market via record ETF inflows, "with volatility moving higher we think it will be difficult for institutional clients to gross up to or beyond the January peaks." So for those bulls who missed the furious buying scramble of late January, is there still a chance for a repeat performance? Not according to Wilson, who notes that "when we look at our internal data combined with industry flows and sentiment, we think there is a strong case that January was the melt-up, or at least the culmination of it." Furthermore, the brief blow off top which stunned everyone, including Jeremy Grantham who predicted a near-term meltup was imminent, wasn't even that according to the bank. Wilson says that he had "several clients tell us they think it was too brief a period to qualify as a proper melt up scenario; but we suggested January's move was perhaps just a punctuation mark on a 59% rally in the S&P 500 from the February 2016 lows (26.6% annualized). In other words, by the time people are calling for a melt-up, it is basically over. Tax cuts were the event to capture investors' imagination, but the reality is that the market had been pricing tax legislation in for months, if not quarters." Wilson uses two metrics to justify his call that "peak sentiment/positioning is behind us are" and that it's all downhill from here. 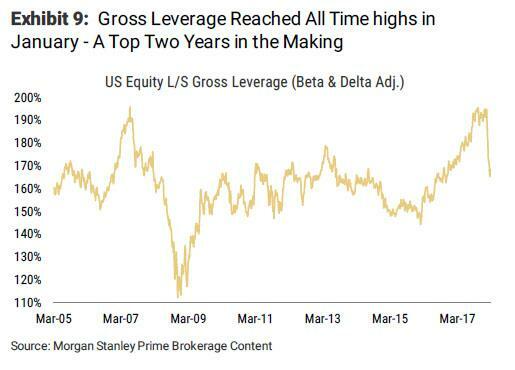 First, he shows gross leverage by the bank's hedge fund clients, which he believes is a good measure of investor willingness to assume risk. In January, this chart showed all time highs on a beta and delta adjusted basis. He also notes that "that this high was two years in the making aligning with our conclusion above that the melt up was almost done by the time it was being widely called for." The January top was also right before the February 5 volatility shock which is what forced clients to reduce the total risk they are holding to a more tolerable level, as shown below. 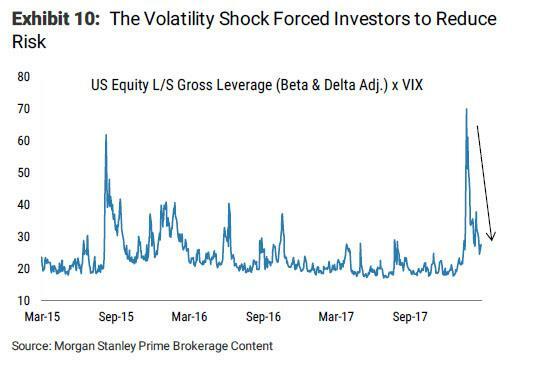 And with volatility moving higher from the cycle low in January, "it will be very difficult for gross leverage to approach the old highs anytime soon." 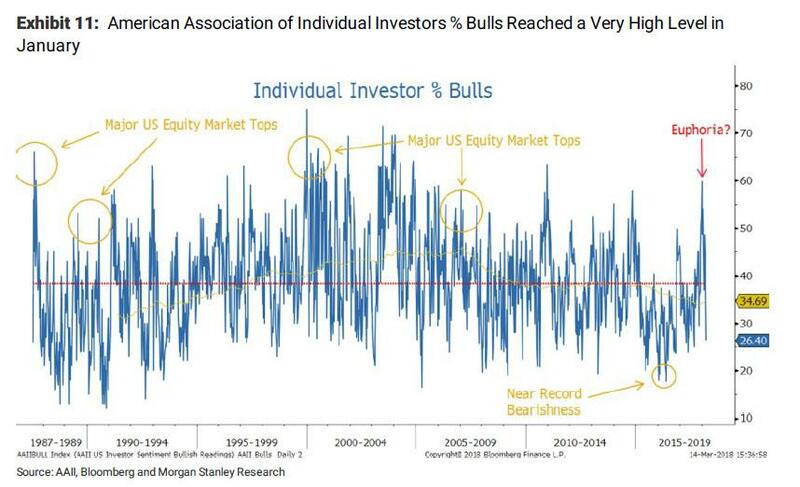 Second, Morgan Stanley also looks at the simplest measure of retail sentiment - the American Association of Individual Investors % Bulls - which Wilson likes "because there is a long history of data and the major peaks and troughs coincide with important market turning points." As we showed previously, retail sentiment reached its most bullish - or rather euphoric - reading since 2010 in late January, and while it had not been a major turning point, it "did mark a pause in the velocity of the stock market recovery from the great recession." Of course, since no analyst leaves themselves without a loophole in case Bullard tomorrow screams "QE4" Wilson caveats that he doesn't view this setup "as a smoking gun for a market top in price" but he does admit that it will mark a top in sentiment for quite awhile, "meaning it is unlikely retail will reach higher heights of excitement this year" concluding rhetorically "after all, what's on the horizon that would get them more excited than a tax cut?" In light of today's market action which saw the market-leading tech sector finally crack, Wilson may be 2 out of 2, first calling the 2017 surge correctly, and now the drop. Wilson wasn't any more optimistic when looking at corporate earnings. Echoing Zezas' Sunday comments, Wilson said that “if we just roll forward the current bottom-up estimates, the forward earnings per share would be $166 and $170 by June 30 and September 30, respectively. That is approximately 3% and 5% higher than today’s $161. Not exciting, but not very bad either." In other words, with the S&P closing just above 2,710, and below Morgan Stanley's base case of 2,750, it is safe to say that in the next few weeks, the bank will shift its outlook to the bear case which sees the S&P sliding back down to 2,300.